The combo is completely online enabled, which lets you play with friends from any part of the game. There is no need to return to the main menu, when your friend gets online he can hop right into your game. This leads to many fun hours with friends. The graphics and audio have also been updated. If you remember playing these classics as a kid you will be surprised with new visuals and a new remixed soundtrack. On the other hand, if you want the original graphics and audio you can always choose so in the options menu. The ability to pick your graphics and audio type gives Final Fight: Double Impact the ability to reach out to both the old and new audiences. The package is a very good deal, with two fun classic games and only 800MSP. It is like paying 400MSP per game. Tons of in game unlockables creates tons of replay value that will test both your skills and your wits as you try to beat certain levels under a certain time limit, or look for secret levels. The video below shows some gameplay footage of both games. Play as Guy, Cody, or Haggar as fight your way through hordes of enemies. Pick up weapons from the ground and play through multiple levels fighting minions on your way to the levels boss. Punch your way through endless enemies or pick up weapons to increase your power. Don’t get knocked over though, because the game is still true to classic arcade games where the AI will keep knocking you down until you are dead. Use magic and weapons as you progress to the top of the tower to defeat Drokmar and save the world. Open treasure chests and locked doors to reveal lot, spells, and companions. What out for traps though, they will make your day miserable. Explore 50 floors, killing tons of enemies. Each enemy has its unique abilities. Find companions to help you with your fight, each one having a unique ability as well. Find spells to kill all the enemies on the field, be careful though because spells hurt you as well when you use them. Compared to the vault challenges, the actual achievements are easy and straight forward and only require patience and practice. The “Locksmith” achievement will take you the longest, as you have to unlock everything. To unlock everything you must complete specific challenges located in the vault and there are over 60 of them, which will require beating certain levels under a time limit, with a certain score, without using a certain amount of continues or even finding a secret level. Coin Gobbler – 20 – Final Fight™: Complete all levels using less than 18 continues. Cody-pendant – 15 – Final Fight™: Complete all levels with Cody. Haggar-ed – 15 – Final Fight™: Complete all levels with Haggar. Who’s that Guy? – 15 – Final Fight™: Complete all levels with Guy. Locksmith – 25 – Unlock everything in the Vault. 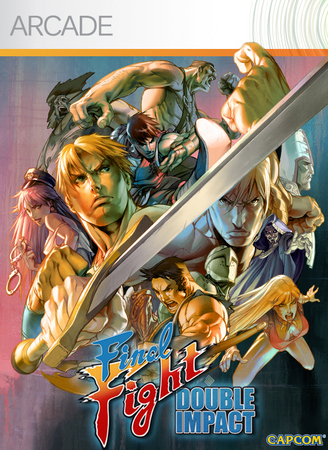 Final Fighters – 10 – Final Fight™: Complete all levels in co-op. Tough Guy – 30 – Magic Sword: Complete all levels using less than 18 continues. Sore Thumb – 10 – Magic Sword: Complete all levels. Anti Hero – 10 – Magic Sword: Decide to take the Black Orb. Smashing! 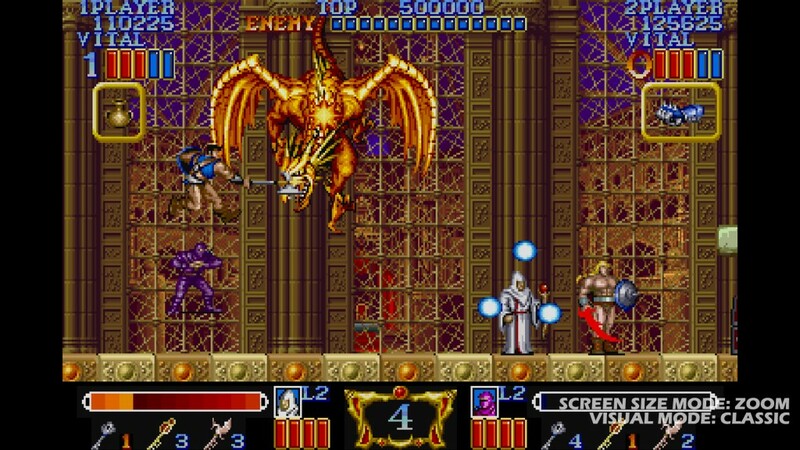 – 10 – Magic Sword: Decide to destroy the Black Orb. Ninja Skills – 30 – Magic Sword: Complete any level without being hit, and without using a Magic Attack. Save the World – 10 – Magic Sword: Fight and kill Drokmar. 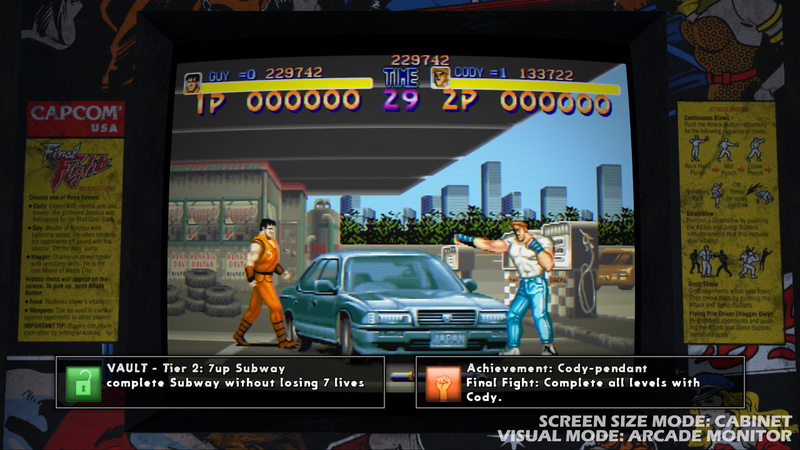 Final Fight: Double Impact is another revived classic to add to your collection. With two classic arcade games each for only 400MSP in this 800MSP bundle. Both games are entertaining and addicting; however, Final Fight and Magic Sword both existed during the arcade era which strived to make you spend as many quarters as possible. Infinite continues make the game not very challenging, but the game is still very addicting and with tons of in game unlockables, Final Fight: Double Impact has a lot of replay value. “Jump in anytime” co-op enables friends to join your game when you are already in yours, with no need to return to the beginning. Tons of in game unlockables: game art, videos, and even manga chapters. For the new and old. With a switch of a button switch between classic or updated graphics and classic or remixed audio. You have to make a custom single player game in order to pause, starting a new game will not let you pause during gameplay. Lack of challenge with infinite continues. Co-op has friendly fire, which is a pain at times.